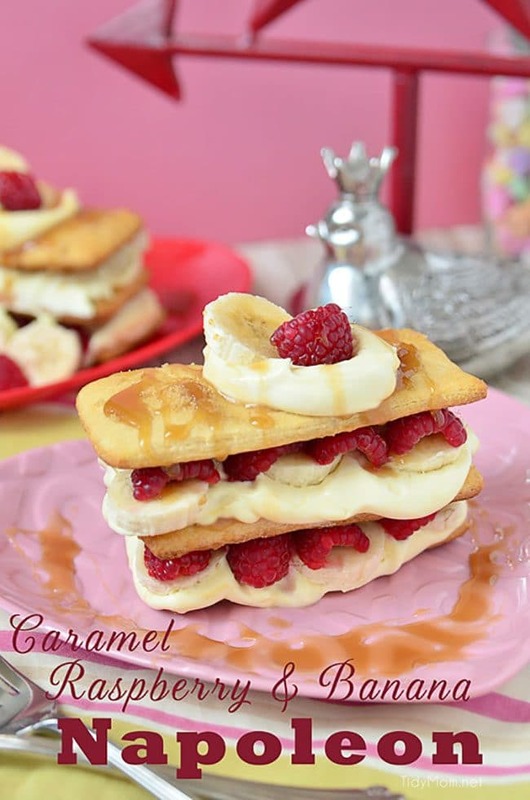 You won’t believe how quick and easy this Caramel Raspberry Banana Napoleon dessert recipe is to make! Refrigerated crescent roll dough and pudding mix let you turn out a pastry shop-style napoleon in a flash! 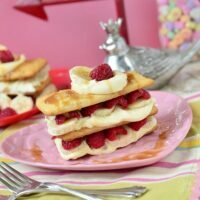 A simple yet elegant dessert for Valentines Day or any day! 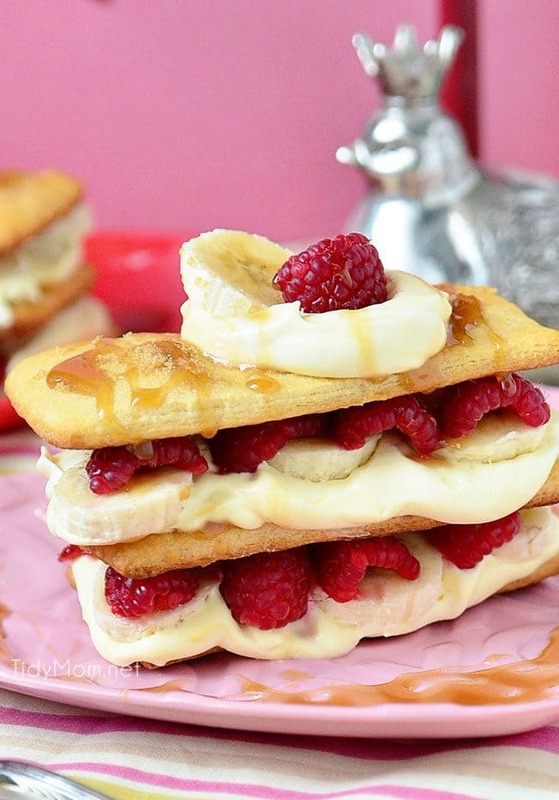 Layers of crescent roll pastry, vanilla pudding, bananas and raspberries topped with a caramel sauce for a perfect Valentines Day dessert. You may recall that when I shared the recipe for the Banana Flips, I said I have been on a banana kick lately. It could be bordering on obsession (therapy could get expensive lol), so I’ll be sure to space them out and hope no one notices. This dessert may look fancy enough for Valentines Day, but your sweetheart will never know how easy it was! The bakery shop favorite is fun to recreate at home using refrigerated crescent rolls and pudding mix. What Is a Napoleon Dessert? Napoleon Cake is a popular cream pastry, also known as a Mille Feuille made with puff pastry and smooth custard-like filling. Like most French pastries – it’s rich and delicate, not too sweet and filled with pastry cream. Next, you will cut each rectangle into four pieces and place on an ungreased or parchment-lined baking sheet. Sprinkle each recktangle with brown sugar. Place in 350° F oven and bake until golden brown. Cool completely, about 15 minutes. Meanwhile, beat milk and pudding mix with wire whisk until it begins to thicken and refrigerated for 30 minutes until pudding is set. To serve dessert, build each napoleon by starting with one of the crispy crescent squares. Dollop on the vanilla pudding mixture. Top with sliced fruit. Add a second crescent crisp and more of the pudding and fruit. 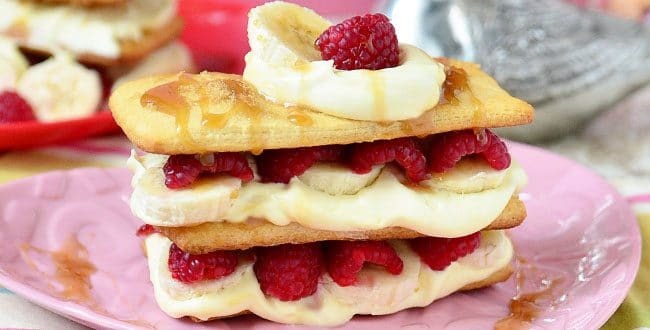 Top with a third crisp, a spoonful of pudding, one raspberry and banana slice and drizzle with caramel topping. Like This Easy Napoleon Dessert Recipe? Pin It! Refrigerated crescent roll dough and pudding mix lets you turn out a pastry shop-style napoleon in a flash! Cut each rectangle into four pieces, forming 3x2-inch rectangles . Place on ungreased or parchment lined cookie sheet. Sprinkle each with brown sugar. Bake 8 to 10 minutes or until golden brown. Cool completely, about 15 minutes. Meanwhile, in medium bowl, beat milk and pudding mix with wire whisk until mixture begins to thicken and refrigerated for 30 minutes until nice and set. To serve, build each napoleon by starting with one of the crispy crescent squares. Dollop on the vanilla pudding mixture. Top with sliced fruit. Add a second crescent crisp and more of the pudding and fruit. Top with a third crisp, a spoonful of pudding, one raspberry and banana slice and drizzle with caramel topping. For kids, you may want to skip the layering. Serve in a bowls. Tear up 2 baked crescent squares, add pudding mixture, top with fruit and drizzle with caramel topping. - Not as pretty but much easier to eat! These totally count as breakfast food, right? Please say yes. I would gladly forgo a bowl of cereal and this with my morning cup of coffee!! Oh does this look tasty & the fact that it is so simple to prepare makes it even better! These look divine… love the food styling! What a gorgeous dessert!! And it has fresh fruit in it, so it’s healthy right?! Looks great and love that it’s an easy, no-fuss but looks fancy kind of dessert! 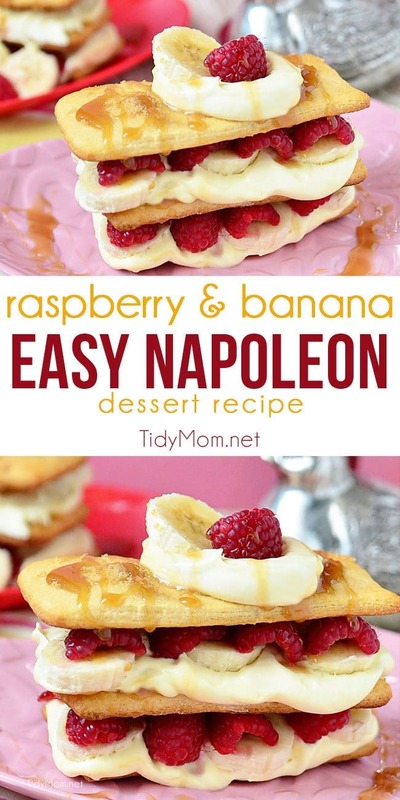 I love this twist on a classic napoleon – one of the best desserts! These look delicious, I’ll have to give them a try! When I first saw the pictures I thought *these Napoleon’s are too pretty to eat* but I know if they were handy to me they’d be gone in a flash. I’m sort of on a banana kick also. I am absolutely addicted to Peanut Butter Chocolate Banana Wraps. I eat two every day since I discovered them. Not everyone likes them, but for some people (like me) the taste combination is addicting. But, basically, you take a flour tortilla, spread peanut butter over it, add a row of banana slices on top of that, and sprinkle with refrigerated (preferably mini) chocolate chips. You roll it up (like a burrito) and then you can slice it in pin-wheel slices and put it on a plate for a nice presentation, or eat the whole thing like you would a burrito. These are nice as they also make easy snacks to pack for an outing. If you’re packing it for an outing, don’t slice it, as the bananas begin to turn when exposed to air. When I gave some to a friend to try, she took one bite and immediately cried, “I can picture these with Nutella instead of peanut butter and fresh strawberries in addition to a few chocolate chips and the bananas. Wow! I con’t wait to try that one! Sort of reminds me of a banana split. Maybe we should name it the Banana Split Wrap =D But, I guess you might also have to add pineapple. I wonder how that would taste? I love anything with creamy pudding and fruit – this looks amazing! You are the QUEEN at crescent roll recipes. This is gorgeous! looks fantastic, I love banana treats! Look fancy to me!!! Looks VERY VERY delicious! Hey. I’m joining you on the banana brigade. I love bananas! Thanks for sharing this delicious recipe. I love the idea of using refrigerated crescent rolls, what an easy way to make an elegant dessert! I want one of these for breakfast. Badly. Love how great this looks. I’m drooling right now. 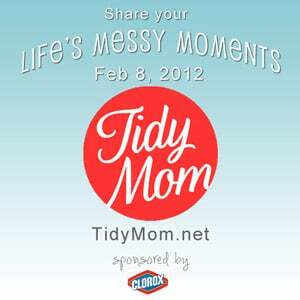 I hope you will come by and Link Up to the I Heart Projects Party I am having on my blog. I became mildly obsessed with napoleons after watching countless episodes of Chopped. 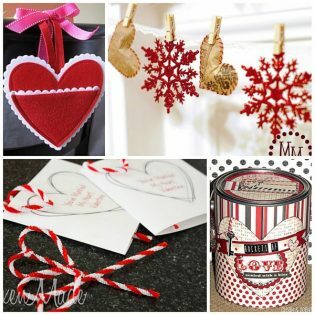 Your version is absolutely perfect for Valentine’s Day! Very impressive and beautiful dessert! Everything on here looks great. I love our photography and your recipes. Such a cheerful blog. This recipe is going to be a hit for my family! Very pretty presentation and simple to do. I love fruit desserts especially around holidays such as Valentine’s Day. Everyone always has so much chocolate and candy that they welcome a pretty, taste dessert.